Act of fraud is common to net. What happens when Unsolicited emails promising million dollars for small assistance received in mailbox? These mails enclose a story which looks real and appeal for reply affirmative. After this, mailbox will receive one more mail asking for little money in advance to complete some required documental formalities. If that demand fulfilled means game is over and recipient became a victim of fraud. Quickly recipient will receives one new mail asking some more money to complete left over formalities, and this process will go on till the time recipient refuses to fulfill demand or run out of money. These fraud mails sent by some evil thought people or group called “Scammer” who always busy with sending thousands of mails per day all over the world called “Scam Mails” to innocents. Some of greedy recipients fall in trap to get those millions and become victim of it. This type of scam in which scammer asks money in advance is commonly known as “Advance Fee Fraud”. These scams can be executed through any of the media like email, sms, fax, phone call or postal mails. The road map of Advance Fee Fraud. Delete it (no quarry, no reply). 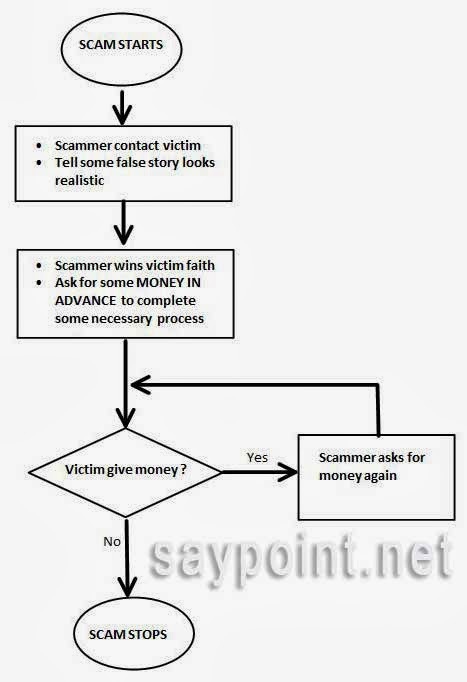 Let the effort of scammer go in vain.